A soil scientist accurately assessing the makeup of the soil in the field. An artist in the studio replicating colors when mixing paints or materials. Quality control experts making sure final product colors match the set standard. Electricians staying safe using standard color codes. A food scientist using custom colors to bring consistent and reliable results. Since color is applicable across so many areas of studies, learning how to read these charts and numbers can be very helpful. 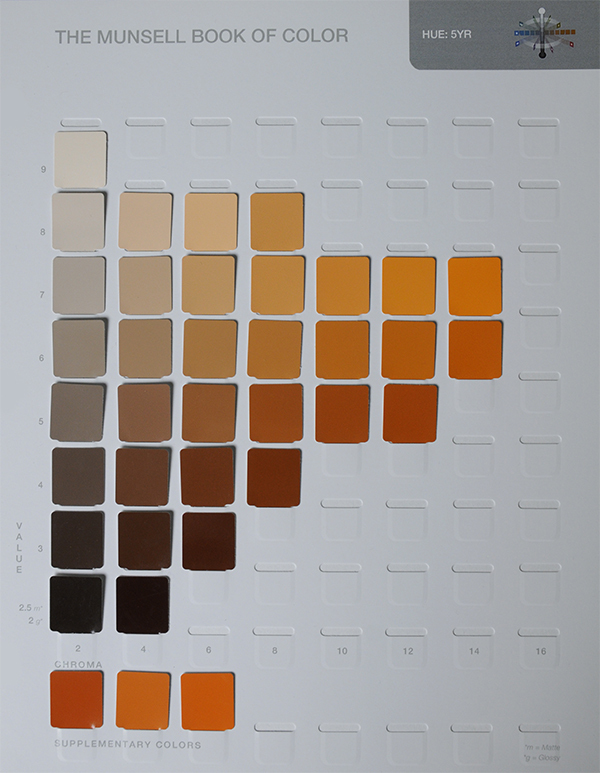 In addition to color charts, Munsell also has color books, which are designed for use in specific industries, based on colors unique to the discipline. For example, the Soil Book of Color contains colors you would find in the field, while the Book of Color contains a standard set of colors that can be used across many industries such as art and design. The steps for reading a chart outlined below can be applied to any of the Munsell color charts or books. The first step is to understand the three attributes of color… hue, value and chroma (also referred to as HVC). Hue is the color such as red, green, blue, etc. In the Munsell system these are given letter codes, i.e. Red (R), Yellow-Red (YR), Green (G), Green-Yellow (GY) and so on. Value is how light or dark a color is. In the Munsell system, value is indicated with a number, i.e. 2, 4, 6 and so on. The value scale runs vertically and moves from lightest (at the top) to darkest (at the bottom) in descending order, so a 2 is going to be darker than a 6. Chroma is how weak or strong a color. In the Munsell system, chroma is indicated with a number, typically in the range of 2-14 (upwards of 30 for colors in the fluorescent family). The chroma scale runs horizontally and moves from weak (from the left) to strong (to the right), in ascending order, so a 2 is going to be weaker than a 6. 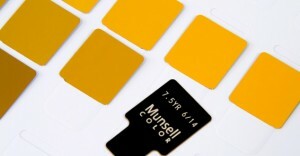 Once you know what the 3 dimensions of color are, you can understand how the munsell color system works. There is an abundance of colors in the world; the color order system allows us to accurately identify and understand the relationship of these colors. In addition, by viewing colors on the charts, we can see how colors related to one another visually. 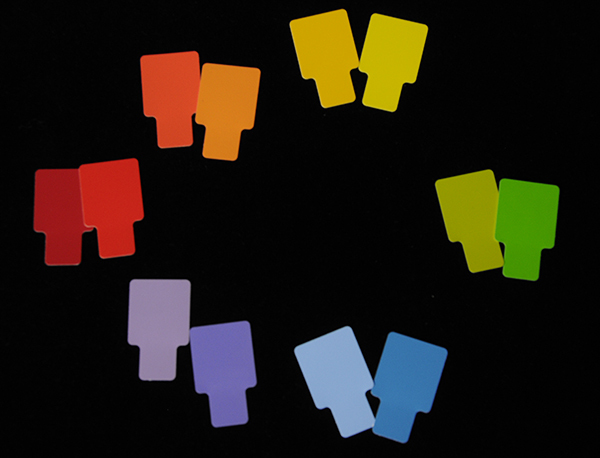 Each color is designated with what is referred to as a color notation; for example, 5R 7/2. As explained above, each of these indicators refer to the 3 attributes of color. 5R is the Hue (or color), 7 is the Value (or lightness/darkness) and 2 is the Chroma (weak/strong). These colors can then be referenced on a Munsell color chart to see what the notation looks like. A soil scientist indicating the colors of the soil layers from a core sample to determine the best uses for the land. An artist is the studio matching the blue sky they are painting. Quality control experts using a color sheet to make sure the red shoes are the right color that was specified to the manufacturer. An electrician knowing which wires are hot, neutral or grounded. A food scientist checking that the colors are not outside the normal range, no one wants to eat blue green beans. Finding evidence of human activity at an archaeological site and being able to determine age. A homeowner making sure the couch they are buying doesn’t clash with the paint on the wall. The ways in which these color charts can be used are endless and we continually are discovering new uses. You only need a basic understanding of color to be able to read a Munsell color chart, however, having an understanding of color will help in making better decisions when selecting colors. To start, we recommend learning more about the relationship of colors… check out the Hue Circle and Color Tree.